we don’t know / how it has begun. the air and the earth / and the sea. sailing on the sea, singing lullabies. Seikilos Epitaph: the song was found engraved on a tombstone (stele) from the Hellenistic town of Tralles, not far from Ephesus. Its melody is recorded above its lyrics in the ancient Greek musical notation. ● Dating to circa 1400 BCE, a hymn to Nikkal, a goddess of orchards, is now the oldest surviving substantially complete notated work of notated music in the world (preceding by almost 1.5 millennia the oldest extant complete notated song dating to ca. 200 BCE – 100 CE, the Seikilos Epitaph, which is performed in our previous work, Periplus, sung by Hélia Correia). The hymn is among a collection of 36 Hurrian songs inscribed in cuneiform on clay tablets, excavated from Ugarit, a port city in northern Syria, which was burned to the ground circa 1190 BCE by the Sea Peoples, a purported seafaring coalition of invaders, originating from western Asia Minor and southern Europe, and contributing to the Bronze Age collapse. The Hurrians were a Bronze Age people of northern Mesopotamia and eastern Anatolia. While some composers’ names are known, this hymn is anonymous, and its transcription remains controversial: there are at least five rival decipherments, each yielding entirely different results. The Hurrian lyrics are at the top of the tablet; below is the Akkadian (Mesopotamian) notation for a song accompanied by a nine-string sammûm, a type of lyre, or harp (other tablets contain instructions for tuning the harp). The text is difficult to grasp, since the Hurrian language is not well understood; in addition, it seems it is a local Ugaritic dialect, differing significantly from other known dialects. ● There is a striking resemblance of the most credible rendering of the hymn’s melody to the emblematic Portuguese song Acordai! (Wake Up! ), composed by Fernando Lopes-Graça before the tablet was found. Although the Akkadian notation refers to a heptatonic diatonic scale, there have been alternative variations in the chromatic genus. Lullabying Children, Waking Up Adults brings to the fore this resemblance to Acordai!, while Mágissa Thálassa combines a) the diatonic and chromatic genera, and b) the most credible interpretation with a disputed decipherment used as an instrumental introduction and bridge. ● Fernando Lopes-Graça (1906 – 1994): a Portuguese composer, conductor and musicologist, influenced by his homeland’s popular music. He was a member of the PCP (Portuguese Communist Party) and a strenuous opponent of the Salazar dictatorship. ● José Gomes Ferreira (1900 – 1985): a Portuguese poet and fiction writer, who was also an activist against the dictatorship, becoming a member of the PCP. I’ve been unfit to tame the waves. Odysseus Aylan, / Ithaca was everything. Yet the voyage of your life / ended too soon. I see your image everywhere / but you are elsewhere. the caresses of your mother / drowned as well. Time was frozen stiff and still / on the seabed fell asleep. When I see the sea / tears start falling down. I’ve lost so I may find / and see him in his grave? 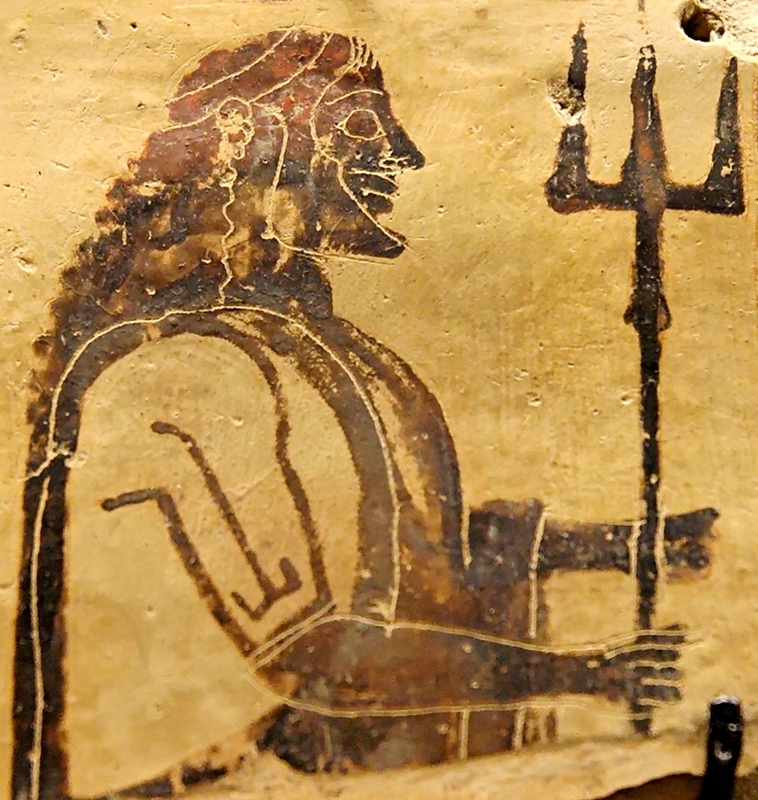 Poseidon holding a trident: from a Corinthian Sanctuary of the sea god. 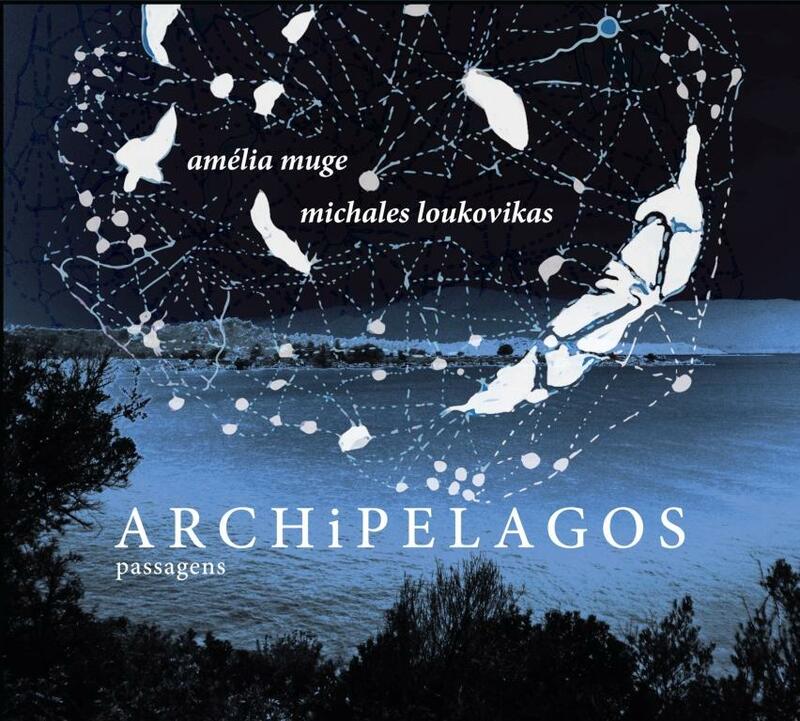 ● Odysseus and Penelope: see ARCHiPELAGOS • VII. ISLANDS OF IMAGINATION ● Aylan: Alan Kurdî (initially reported as Aylan, 2012 or 2013 – 2015) was a three-year-old Syrian Kurd whose image made global headlines after he drowned on September 2, 2015 in the Aegean between Bodrum (ancient Halicarnassus) and the island of Kos. He and his family were refugees trying to reach Europe. ● Poseidon: one of the twelve Olympians in the Greek pantheon. His domain was the ocean, and he was called the God of the Sea. In the Odyssey, he is notable for his hatred of Odysseus who blinded the god’s son, the cyclop Polyphemus. This prevented Odysseus’ nostos for many years. ● Sirens (Σειρῆνες): mythological daemons combining women’s heads and body of birds, and related to water, love and death; they lured sailors with their enchanting music and voices to shipwreck on the rocky coast of their island.